The Embraer Phenom 100 aircraft has been selected to provide multi-engine training for armed forces pilots in the UK. The Phenom 100 aircraft is developed by Embraer. Image courtesy of Josh Beasley. The Phenom 100 aircraft is powered by two PW617-F turbofan engines. Image courtesy of Rotareneg. Developed by Brazilian aircraft manufacturer Embraer, Phenom 100 will be configured to provide RAF students with multi-engine training in specific areas such as high-altitude operations, flying in multi-aircraft formations, asymmetric flying, crew resource management, flying with a second engine, and dealing with emergency procedures. The Phenom multi-engine trainer aircraft will eventually replace King Air 200 twin-engine turboprop aircraft fleet in service with the RAF since 2004. When operational, the airplane will be based at RAF Cranwell station in England. In February 2016, training design and delivery organisation Ascent received a fixed-price contract worth £1.1bn ($1.58bn) from the UK Ministry of Defence (MOD) to provide fixed-wing military flying training services for the UK Military Flight Training System (UKMFTS) programme through May 2023. Ascent is jointly owned by Lockheed Martin and Babcock International and won a 25-year contract from the UK MOD in June 2008 to deliver aircraft, courseware, instructors, infrastructure and support services for fixed and rotary wing pilots and rear crew for the UK Armed Forces. Lockheed Martin and Babcock will deliver the ground-based training equipment and infrastructure for the fixed-wing training aircraft. Affinity Flying Training Services, a joint venture between Kellogg Brown and Root (KBR) and Elbit Systems UK, was selected as the preferred bidder in the Aircraft Service Provider (ASP) completion for the UKMFTS fixed-wing programme in October 2014. Ascent awarded a subcontract, valued at £500m ($713m), to Affinity Flying Training Services to procure and operate three fixed-wing aircraft fleets comprising five Phenom 100s, ten Beechcraft Texan T-6Cs and 23 Grob G 120TP Prefects. The contractual scope also includes maintenance and support services. The Grob G 120TP Prefect will provide elementary flying training, while the T-6C is intended to provide basic flight training. The aircraft are expected to be operational in 2019. 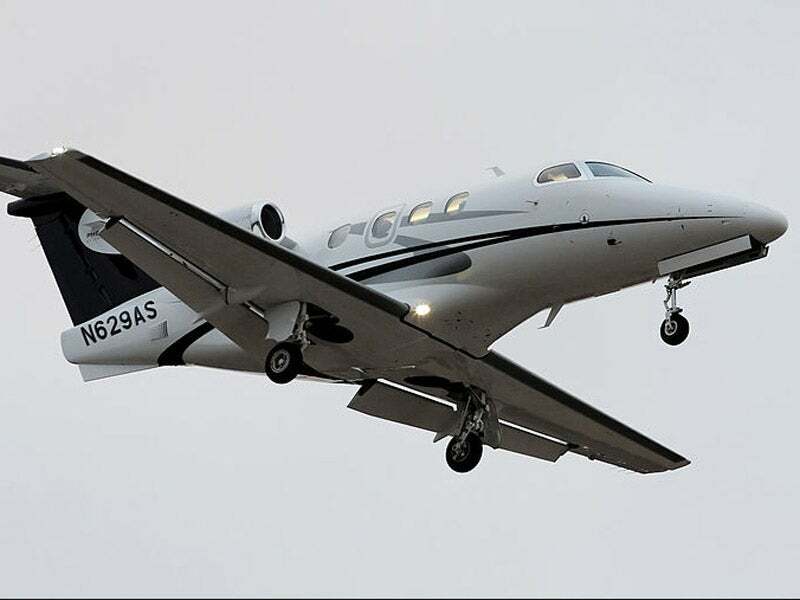 The Phenom 100 aircraft features low wing monoplane design, T-tail configuration and trailing link landing gear. The main wings are equipped with multi-function spoilers to reduce the lift. A rudder on the vertical stabiliser provides directional stability. The airplane has a length of 12.82m, height of 4.35m, wingspan of 12.3m, and baggage capacity of 70m³. The entrance door is fitted on the left side of the fuselage. The Phenom 100 trainer aircraft is manned by an instructor, two student pilots and four students as rear crew. The student pilots are seated in the modern glass cockpit, while the cabin accommodates the instructor and four crew members. The cockpit and cabin windows provide enhanced visibility. The Prodigy Flight Deck 100 fully-integrated touchscreen avionics suite is based on the Garmin G3000 platform and provides improved situational awareness, as well as enabling safe and easy operation while reducing the pilot workload. "Embraer Phenom 100 business jet has been selected by the UK Ministry of Defence (MOD) to provide flight training for pilots of multi-engine aircraft of the Royal Air Force (RAF)." The flight deck integrates flight management system, weather radar, engine-indicating and crew-alerting system, synthetic vision system, navigation and communications, WAAS, charts and maps, Central Maintenance Computer, Integrated Electronic Standby Instrument (IESI), as well as electronic checklist and system synoptic. The flight data is displayed on the primary flight displays and multi-function displays. In April 2016, CAE was awarded a contract by Lockheed Martin to develop synthetic training equipment including four Garmin 1000 part-task trainers, a Phenom 100 flight training device (FTD) and a Phenom 100 full-flight simulator (FFS). The systems will be delivered to the RAF in 2017. The FFS and FTD systems will have the CAE Medallion-6000 image generator and databases built to the Common Database (CDB) standard, which allows distributed, interoperable mission training. Two rear-mounted Pratt and Whitney Canada PW617-F turbofan engines provide a cruising speed of 390kt. Each engine has a two-stage compressor, a reverse-flow combustor and a dual-channel full-authority digital engine control (FADEC) system, developing a thrust of 1,695lb. The aircraft has a range of 1,178nm and can fly up to an altitude of 41,000ft.